I must hasten to point out that the header image does not portray either of the concert venues! 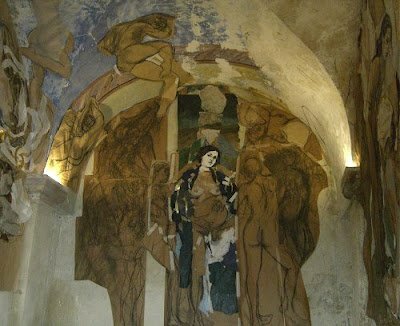 It was taken by me in 2007 in another intimate and involving performance space, the Chapelle St Alexis, Malaucène, France, and the murals are the work of Michael Bastow. Photo is (c) On An Overgrown Path 2012, any other copyrighted material on these pages is included as "fair use", for the purpose of study, review or critical analysis only, and will be removed at the request of copyright owner(s). Report broken links, missing images and errors to - overgrownpath at hotmail dot co dot uk Also on Facebook and Twitter.